The Prime Minister, Shri Narendra Modi and the Prime Minister of Japan, Mr. Shinzo Abe during delegation level talks, at Mahatma Mandir, in Gandhinagar, Gujarat on September 14, 2017. Breaking the ground for the ambitious Rs 1 lakh crore Bullet Train with major Japanese aid, India and Japan on Thursday elevated their bilateral ties to new levels and called for a free and open Indo-Pacific region where sovereignty and international laws are respected, in an apparent message to China which has disputes with most neighbours in the South China region.A day after staging an unusual road show in Ahmedabad, which critics said was done with an eye on upcoming Gujarat polls, Prime Minister Narendra Modi held his annual bilateral summit with Japanese Prime Minister Shinzo Abe and came out with a 13-page joint statement titled "Toward a Free, Open and Prosperous Indo-Pacific" laying out the new contours of the relationship.In a snub to Pakistan, the two countries urged it to bring to justice the masterminds behind the Mumbai and Pathankot terror attacks. They pressed all countries to work towards rooting out terrorist safe havens and infrastructure, disrupting terror networks and financing and halting cross-border movement of terrorists. The joint statement denounced North Korea's nuclear programme and its continued development of its weapons and ballistic missile programmes including its latest nuclear test. The highlight of the day was the commencement of the work on the Ahmedabad-Mumbai High Speed Rail Project, modelled on the lines of the famous Shinkansen (Bullet Train) technology by symbolic digging of the earth at the Sabarmati railway station. Modi hailed the project that will help passengers cover 500 km in three hours at a speed of over 300 km per hour as a "new pace" in India's progress to achieve a "new India" by 2022.The project adds to the growing list of major India-Japan infrastructure cooperation projects.The discussions between the two leaders covered the entire gamut of special, strategic and global partnership and dealt with various issues including the recent Doklam military standoff between India and China that ended ahead of Modi's visit to China for the BRICS Summit. "The two Prime Ministers affirmed strong commitment to their values-based partnership in achieving a free, open and prosperous Indo-Pacific region where sovereignty and international law are respected, and differences are resolved through dialogue, and where all countries, large or small, enjoy freedom of navigation and overflight, sustainable development, and a free, fair and open trade and investment system," said the joint statement. "The two Prime Ministers underlined that India and Japan could play a central role in safeguarding and strengthening such a rules-based order." Both the leaders agreed to align Japan's Free and Open Indo-Pacific Strategy with India's Act East Policy, including through enhancing maritime security cooperation, improving connectivity in the wider Indo-Pacific region, strengthening cooperation with Asean, and promoting discussions between strategists and experts of the two countries. Briefing the media after the summit, Foreign Secretary S. Jaishankar said both sides agreed to root out safe havens for terrorists and cooperate against terrorist threats from groups like Al Qaeda, Islamic State, Jaish-e-Mohammad and Lashkar-e-Taiba.Both also agreed to enhance defence and security cooperation and dialogues, including the Malabar maritime and other joint exercises, defence equipment and technology cooperation in such areas as surveillance and unmanned system technologies.According to Jaishankar, so far this cooperation had been limited to the maritime sector. Now this will be expanded to their armies, air forces and coast guards. Modi and Abe reiterated their support for each other country's candidature in the UN Security Council "based on the firmly shared recognition that India and Japan are legitimate candidates for permanent membership in an expanded Security Council".Addressing the media, Modi said this was not just the start of a high-speed rail. "Keeping in mind our needs in the future, I believe this new railway philosophy will be the lifeline to a new India," he said. "India's continuing development has now been linked to high speed. "In his remarks at the ground-breaking ceremony of the rail project, Abe said "a strong India is in Japan's interest, and a strong Japan is in India's interest. Today, on this day, that part of the bright future is seen in solid form".Modi thanked the people and Parliament of Japan for ratifying the civil nuclear agreement signed during his visit to that country. "This will open a new chapter in our cooperation on clean energy and climate change." Modi said Japan invested $4.7 billion in 2016-17, an 80 per cent rise from the previous year. "This makes Japan the third largest investor in India.Connectivity was a key issue in this year's summit, with a new India Japan Act East Forum being set up that will see Tokyo play a more pro-active role in developing India's northeast.Jaishankar said that though Japan had been assisting the Northeast in developing the road infrastructure, "this time the intent was take it to a much higher level". 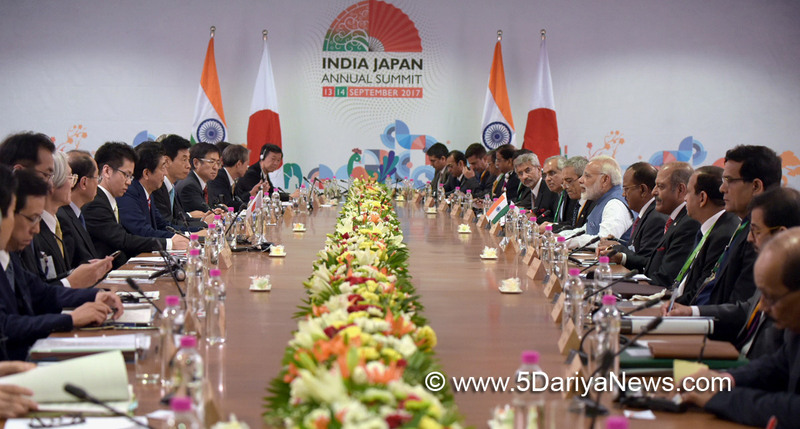 After the summit, India and Japan signed 15 agreements including in the areas of connectivity, disaster management, skills development and investments.